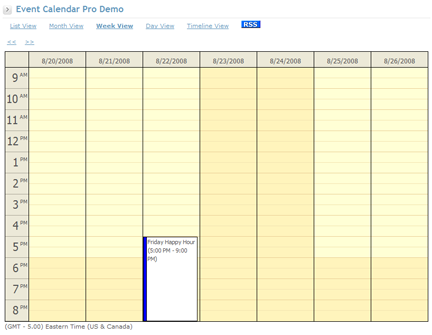 Event Calendar Pro provides a feature rich solution for publishing event calendars. Once installed in your mojoPortal site, you can add instances of Event Calendar Pro to as many pages in your site as you like, so you can have multiple Calendars with different events. A nightclub or a band could use this feature to list their concerts and even sell tickets to concerts. You can use it for course or class registration by creating recurring events and specifying that the ticket includes the recurrences. 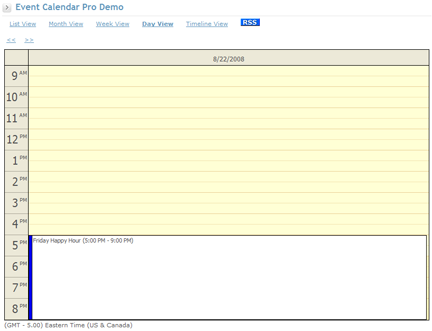 For a guided tour of Event Calendar Pro, please see this demo/training video. You can also try it out yourself on our demo site demo.mojoportal.com. Available licenses: Single Installation License, Server License or Enterprise License. 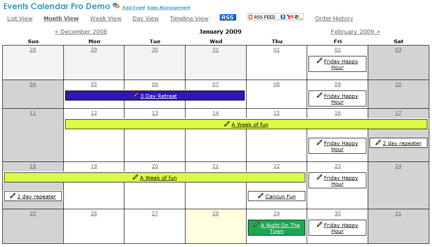 Month View - the familiar calendar view with support for displaying events that span across days, weeks or months. List View - a more accessible view for some users, allows paging through events. 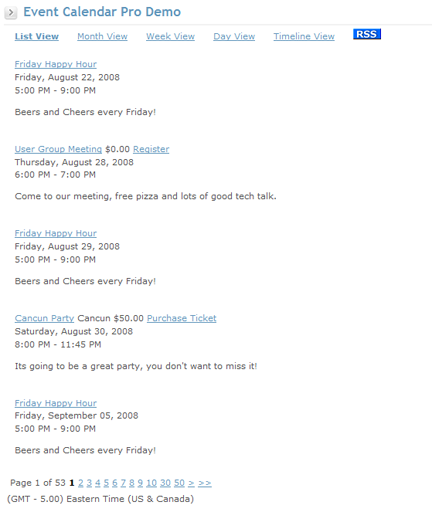 Events in this view are formatted in hcalendar format. 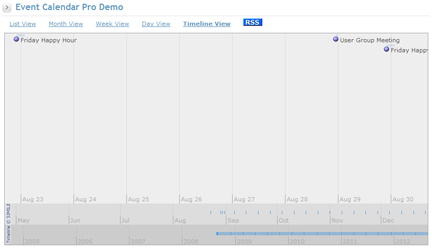 Timeline View - very interesting way to visualize your events on a timeline. 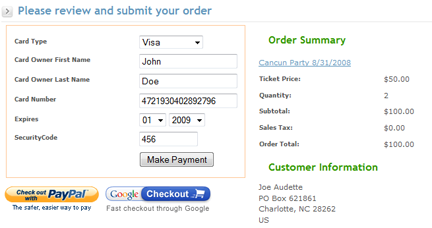 You can sell tickets online using Authorize.NET, PlugNPay, WorldPay, PayPal, or Google Checkout. You can require registration for events that are free. You can expose the events as an RSS feed so users can subscribe to event notification using an RSS reader like Google Reader. Google Maps and Bing Maps are integrated so you can enter the location of your event and a Map will automatically be displayed, and optionally users can get driving directions or search for hotels or restauarants near your event. Free upgrades to new versions of Event Calendar Pro for a year after purchase. You can also migrate data from the free mojoPortal event calendar using a utility available in the article Event Calendar Pro Tips and Tricks. Click an image to see a full size version. First you need a web site running the free open source mojoPortal software (version 2.7 or higher) using MS SQL MySql, PostgreSql, or SQLite for the database. 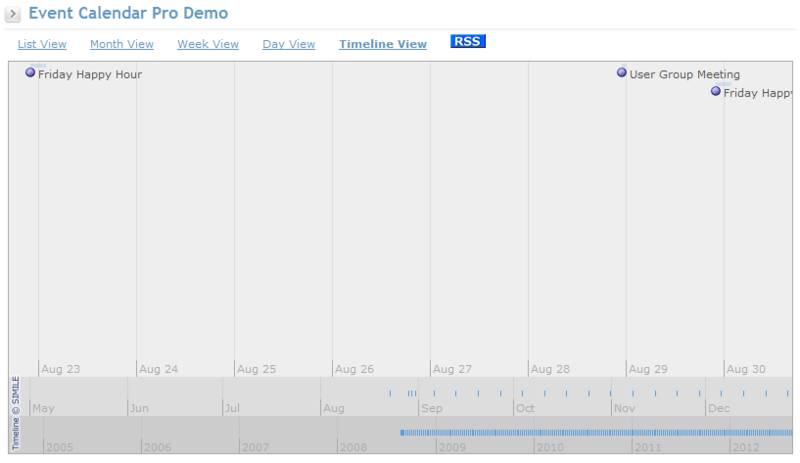 You should get your site working before you buy the Event Calendar Pro Feature. For information on setting up a mojoPortal site, see mojoPortal Installation. 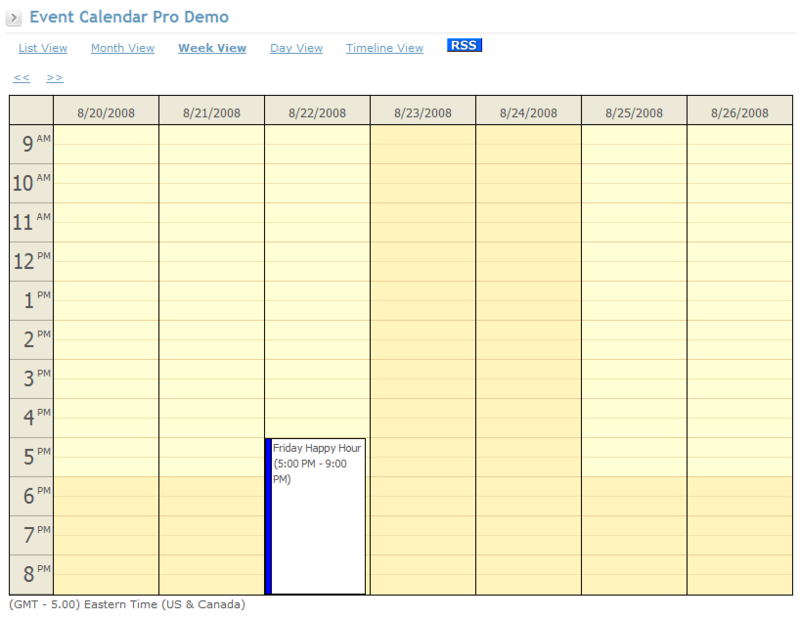 If you need an older version of Event Calendar Pro, contact us. After purchasing Event Calendar Pro, download the .zip file to your local machine and using an FTP Client like FileZilla, copy the contents of the folder corresponding to your database platform (mssql, mysql, pgsql, or sqlite) into the root folder of your mojoPortal web site. 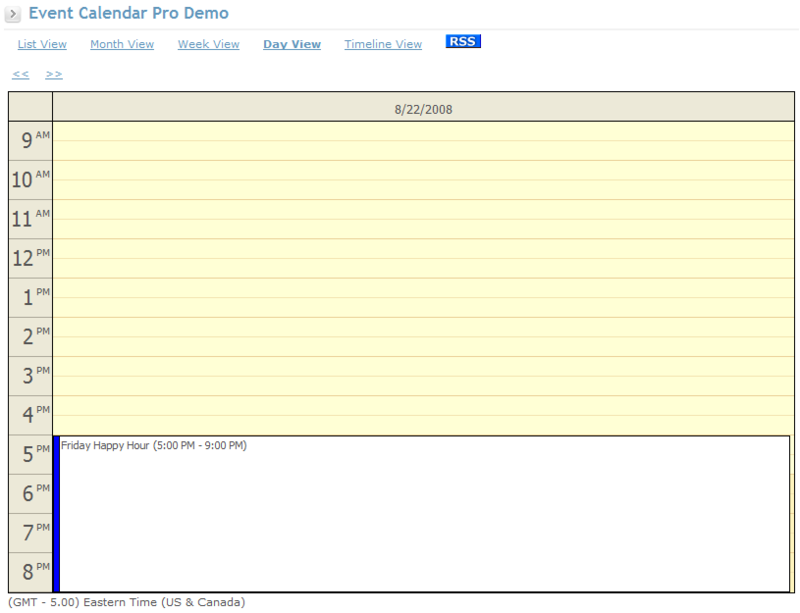 Then visit http://yoursiteroot/Setup/Default.aspx to complete the installation of Event Calendar Pro. 3.5.0.0 2018-10-20 compatibility update for mojoPortal 2.7, MySQL 8 Support, Google Map fix, more Display Settings, read more in the mojoPortal 2.7 release announcement. 3.4.1.6 2014-01-23 added support for PayPal Express Checkout, added 2 new theme-able DisplaySettings. Requires mojoPortal 2.4.0.2 or higher. 3.4.1.0 2012-11-28 fixed bug where when allowing anonymous ticket purchases with PayPal, if the user clicked the link going back to the site they would see the Access Denied message since order detail is not allowed for anonymous orders. Requires mojoPortal 2.3.9.4 or higher. 0.0.3.2 2011-01-06 fixed bug where allowing ticket purchases without site registration was not working. fixed minor style bug in calendar view and added some additional CSS classes to make custom skinning easier. 0.0.2.7 2010-05-07 fixed bug where RSS feed had incorrect URLs if hosted in a virtual directory. Added better time zone handling to adjust correctly for Daylight savings when creating future events. 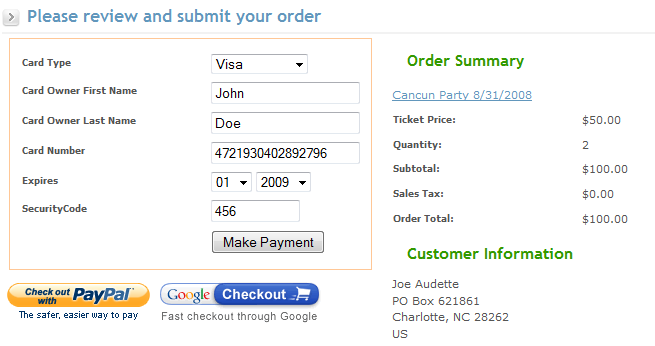 Added config setting to allow ticket purchase/registration without registering/signing into the site. Added new recurrence type for every 14 days. Now supports will pay later registration without any commerce configuration. Added option to use the same sales begin date for recurring events. 0.0.2.5 2010-02-24 fixed bug where view menu was shown on event detail when only 1 view is enabled, it is not supposed to be shown in this case. Fixed bug where changing the status of a ticket order to cancelled did not reduce the number of sold tickets so sold out could occur when tickets were still available. 0.0.1.6 2009-09-01 fixed a localization issue in the date picker for recurrence end date. Added an option to update all recurrences at once, added an option to hide event details from unauthenticated users, fixed issue where multi day events that had a start date earlier than the current date were not shown on the List View. 0.0.1.3-b 2009-03-21 fixed a few minor HTML validation bugs and now if only 1 view is allowed the link for that view is suppressed. 0.0.1.3 2009-02-26 fixed bug where incorrect currency was sometimes shown on event detail page. Integrated with new mojoPortal commerce reporting system so ticket sales have reporting and order history is integrated into user profile. 0.0.1.0 2009-01-28 a major upgrade, can be used for class or course registration by creating a recurring event with the option for ticket to include recurrences. Per event map settings and meta data, ability to color code events on month view. New summary filed allows a shorter description on List View and Ticket Order page. See this blog post for more details about this release.